Mathematical and theoretical physics unit studied the subjects related to random matrix theory and conformal field theory. The intersection numbers of the moduli space of spin curves and the conformal bootstrap method for three dimensions are studied. Random matrix theory is applied to biological systems. The study of higher Teichmuller space and various topological invariances. The topological field theory TFT was studied from random matrix theory, which is generalization of two dimensional gravity theory by the tuning the parameter of the external source. This was developed by the collaboration with Edouard Brezin. The study is generalized to the super symmetric case, and to super Riemann surfaces. Non-orientable cases like Klein surfaces are also studied through random matrix theory. We studied both basis and applications of the conformal field theory putting our emphasis on the conformal bootstrap and non-unitarity. Since the bootstrap may potentially give us the solutions corresponding to the CFTs without Lagrangians, it is of fundamental interest to understand, in the most general settings, what kinds of the solutions may exist. This problem gets even harder and more interesting when one relaxes the unitarity condition. 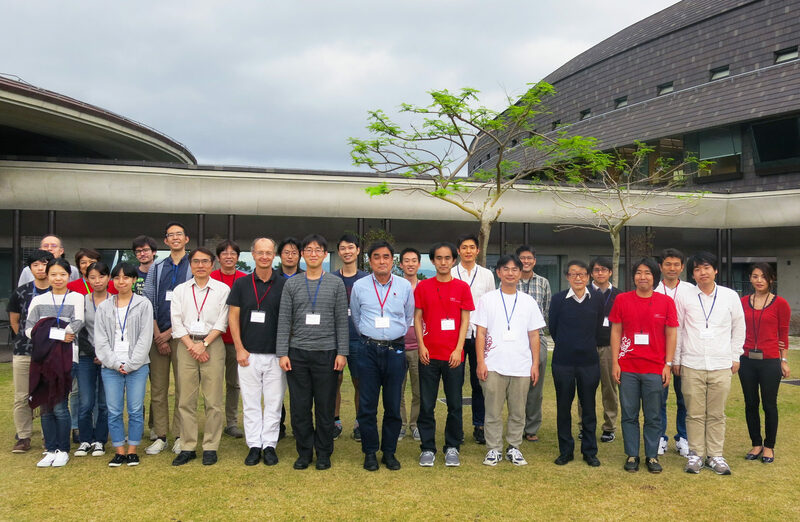 We also held successfully a medium-scale symposium at OIST on the conformal bootstrap co-organized with Slava Rychkov (IHES) and were able to foster fruitful discussions among active researchers of all generations. This project was supported by JSPS KAKENHI No. 16K05491 Grant-in-Aid for Scientific Research (C). We further developed the phenomenology for the four inter-time classes of the low frequency earthquakes (LFEs) found in FY2016 using the machine-learning clustering analyses. The key finding was that this classification, improved by taking into account proximity (10km) of consecutive LFEs, reveals the quiescence (30 days and four months) of the shortest inter-time class (median 23 seconds), which we call S1. These shorter-term anomalies of the LFEs found inland are in good contrast to the known quiescence of the conventional earthquakes in ocean, which begins much earlier (23 years) before the 2011 Great Tohoku Earthquake. We proposed a generative model in terms of non-homogenous Poisson processes for the four classes of LFEs. In particular, the class S1 is characterized by a generalized gamma distribution with the shape parameter 1.6, suggesting the repulsive nature of S1 in the inter-time domain close to zero, which is in contrast to the attractive nature of the conventional earthquakes due to aftershocks. The volcanic tremors and conventional earthquakes are also included in our analysis. We also discuss a possible geodetic interpretation. It is concluded that the quiescence of the shortest inter-time classes of the LFE and of the volcanic tremors can be a precursor event for the 2011 Great Tohoku earthquake. Hidehiko Shimada focused on two subjects. One is the universal behaviour of Lyapunov exponents of a chaotic system with large number of degrees of freedom at late time. He is continuing his investigation in particular focusing on the behaviour of the exponent near a phase transition. Some of the results are presented in his paper written with Masanori Hanada and Masaki Tezuka published in Phys. Rev. E.
The other subject is the so-called D=6 N=(2,0) CFT. He proposed a formulation of it in terms of closed tensionless string field theory with a matrix-valued string field. The result is on the arxiv, arxiv:1805.10297, written with Sudarshan Ananth, Stefano Kovacs, and Yuki Sato. By turning on/off the transcriptions of genes in accordance with the cellular cycles, the circumstances and the cell types, the molecules in the human cells form huge complex interaction networks. These interacting molecules sometimes promote functions of proteins and sometimes they inhibit each other. In the nucleus, the genes which code the proteins have spatial and temporal correlations in their expression patterns. From the observation of the gene co-expression patterns with the high-throughput experiments such as microarrays or the next-generation sequencing technology, the gene interaction networks which are related especially to human disease including cancer have been studied extensively. The investigation of topological modifications of the gene interaction networks in cancer cells is important for understanding the disease. We study gene interaction networks in various human cancer cells with the random matrix theory. We use the Cancer Network Galaxy (TCNG) database which is the repository of huge gene interactions inferred by Bayesian network algorithms. The size of the gene interaction matrices is 8000 and the mean degree (the number of nonzero elements in each row) is about 10. When the number of edges (interactions) is more than 38000, we observe the famous Wigner distribution of the nearest level spacing P(s). On the other hand, when the edge number is less than 38000, P(s) behaves as the Poisson distribution. S. Hikami, Conformal bootstrap analysis for the Yang-Lee edge singularity, Progress Theoretical Experimental Physics, Volume 2018, Issue 5,1 (2018), 053 | 01, https://doi.org/10.1093/ptep/pty054. Scale invariant theories, i.e. theories which look the same at all distance and energy scales, play an important role in physics. Through Wilson’s renormalization group, scale invariant theories arise naturally in phase transitions. They are also the bread and butter of current thinking about particle physics beyond the Standard Model. These theories usually possess an emergent symmetry, conformal invariance, and are hence referred to as `Conformal Field Theories’ (CFTs). The quest to classify and solve CFTs is a major goal of theoretical physics. Recently, this quest has received a strong boost with the development of the ‘conformal bootstrap’ technique. This workshop will bring together two groups of researchers: theorists working on the conformal bootstrap and on formal aspects of CFTs, and condensed-matter and statistical theoretical physicists working on the concrete examples of systems exhibiting phase transitions described by CFTs. The goal will be to inform about the most important theoretical and practical developments in the conformal bootstrap, and about the most urgent questions relevant for condensed matter and statistical physics which can be addressed using conformal bootstrap. The moduli space of compact Riemann surfaces, the space of all biholomorphism classes of compact Riemann surfaces, is one of the most attractive subjects in mathematics. Nowadays it firmly combines mathematical physics and integrable systems with low-dimensional topology including hyperbolic geometry of surfaces, which induces the Weil-Petersson symplectic structure on the space. In particular, the topological recursion by Eynard and Orantin generalizing Mirzakhani's recursive formula for the Weil-Petersson volume has some strong influence in various research areas. In this workshop, we will read intensively some research papers on the symplectic structure of the moduli space and related topics, and will have some talks on original researches. This workshop is supported by a joint project between the OIST and the University of Tokyo. This workshop is supported by a joint project between the OIST and the University of Tokyo. Venue: Room 123, Graduate School of Mathematical Sciences Bldg., University of Tokyo (Komaba Campus). Theory of Teichmuller space has a long history for the moduli space of Riemann surface. Recently beyond classical Teichmuller space research, new extended concept and technique are developed and they are important for various areas of mathematical physics. Particularly higher Teichmuller space attracts interest, which concerns SL(n,R) geometry and its boundary. In this mini symposium, we concentrate on the new concept and technique and discuss from wide point of view of topology, physics and integrable systems. For examples, the cluster algebra and open intersection numbers are discussed closely. We intend to develop a theory for new structure of Teichmuller space in a new direction of mathematical physics. Venue: Room 056, Graduate School of Mathematical Sciences Bldg., University of Tokyo (Komaba Campus). Seminar via TV conference system in Room B611 (Lab2) , OIST. Title: "Various applications of supersymmetry in statistical physics". Abstract: Supersymmetry is a fundamental concept in particle physics (although it has not been seen experimentally so far). But it is although a powerful tool in a number of problems arising in quantum mechanics and statistical physics. It has been widely used in the theory of disordered systems (Efetov et al. ), it led to dimensional reduction for branched polymers (Parisi-Sourlas), for the susy classical gas (Brydges and Imbrie), for Landau levels with impurities. If has also many powerful applications in the theory of random matrices. I will briefly review some of these topics. The purpose of the school will be to introduce graduate students to foundational results in commutative algebra, with particular emphasis of the diversity of the related topics with commutative algebra. Some of these topics are developing remarkably in this decade and through learning those subjects the graduate students will be stimulated toward future research. The lecturers will give topics courses and then the graduate students will meet in small groups and challenge problems and have discussion sessions related to each topic.